Ron and I left Salome Arizona and headed to Bullhead City where we spent 3 weeks visiting with my sister and Calvin. We had a nice Valentine Dinner at the Edgewater Casino. Ron decided to go out with his metal detector and found not gold but a pretty rock with crystals all over it.. To bad it was not gold. We went rock hunting and had a posse of mules watching us from up above the mountain. We went golfing one day, laid by the pool (working on our tans), went to a couple of movies and just relaxed. Bullhead City is very windy most of the time but the weather is nice and warm. We took a drive one day to Seligman Arizona. On the way back we went Route 66. The last time we were on that road was with a group of friends on our motorcycles. It was in April and the weather was much different. That day I was in shorts and a t-shirt. The day on our motorcycles we were wearing heated gear and freezing. After 3 weeks it was time to start working our way back to Carson City. We decided the next stop would be Pahrump, NV for a couple of weeks to wait out the weather. We drove to Death Valley the other day. The desert is starting to bloom and it was not to hot. We drove up to Dante’s View just before sunset and what a view. There we a couple of ladies setting up these wind ornaments. They work for the gallery and artist that make these in Utah. They travel all over looking for interesting places to showcase the art. They were on Dante’s View setting up to take pictures of the art and sunset. Must have been something with the colors reflecting off the salt flats down below. Ron was mad after we left that we should have stayed for the sunset and that we are always in a hurry. Don’t know where he gets that from. Guess he was having a bad day. We played golf the other day. Guess my newest past time is gold and I will need to breakdown and get a set of clubs. Next is bowling……. We will be leaving next week on our trek to Carson City. We need to be there by the week of March 21 for doctor appointments, taxes etc. It has been a year since we left. I can’t believe it. Where has the time gone!!!!!! Ron and I headed from Casa Grande to Huachuca City, AZ. at 5000 ft elevation. After getting set up Brandy (cat) wanted to go outside so I put her leash on and she and I went for a walk. As we were walked just behind the bus in what I thought was grass she kept jumping so finally I picked her up and her paws were full of goat heads so I tried getting them out and I lost my balance from my sandal and I landed my right foot in a patch of goat heads. So here I am trying to get Ron to rescue us as I am holding the cat like a flamingo on one leg. Ron finally got the cat and she was not a happy camper getting those goat heads out and putting her back in the RV while I stood with my right leg up waiting for him to pull out the goat heads from my foot. Well we won’t be going for a walk again in that stuff. The next day we drove to Tombstone AZ. An old western town where the OK Corral is. This is an old mining town but we did not see any tailings like in Virginia City so not sure where the mining took place. Not a town like Virginia City, because I guess it has always been a viable town even since the mining stopped. But they still have the main street where they want it to look like it did in the 1800″s. Went through the Courthouse/Jail/Recorders/Post Office which has been made into a museum to learn about Tombstone. All pretty interesting. Wonder how people came to be out in the middle of the high desert in Southern Arizona in those days??? Had lunch at Big Nose Kate’s who was suppose to be Doc Holiday’s girl friend. Neat place and good food. Ron and I found out there were some wineries in this part of the area so we decided to go find them. In Elgin AZ population 35 or so, we found 4 wineries that were open. Yes there were vineyards also. We were shocked that they could grow grapes in the desert. I did talk Ron into buying some more wine to add to my collection. It was actually very good…go figure! Then another day we took a drive to Bisbee AZ. This was an old copper mining town. If you like antique shops this is the place. After having lunch we drove down to where the open pit mine is and looks like it is still currently active. There was this street in Lowell. And old town that had it’s beginnings in the late 1800’s but was mostly gobbled up by the open pit mine. They have taken two blocks of the main street and made them into an Americana display. Like a time warp to the 1950″s main street America. We could not believe what we were seeing. It appeared to be out of an old movie. There were old cars, motorcycles, bus station, Sprouse Ritz store, Shell gas station, with a restored 1954 Ford station wagon in the drive, Indian motorcycle shop, Harley Davidson shop all which were not operating but with REAL vintage motorcycles in the windows. This town obviously did not make it but they brought back one main street. Pretty cool. Felt like you were walking down a main street in the 1950’s America. Just before leaving Huachuca City we had to go through the Krachner Caves. The cave was discovered in the 70’s by a gentlemen that went around looking for caves. He found a sink hole and crawled through it with a buddy and what a find! The cave was amazing. We could not take pictures, they made us leave our cameras and phone behind. but if you are ever in the area you need to go through. After being in Huachuca City for a week we left for Yuma AZ. We stayed at Yuma Lakes RV Resort just on the outskirt of town. Yuma Lakes has a sister resort in El Golfo de Santa Clara Mexico so Ron and I drove down to check it out. It was about 2 hours of driving through desert. Once we got there it was nothing like we expected. It was desolate and the RV park was just o.k. The town was empty and the wind was blowing sand everywhere. The Sea of Cortez in this area is not very deep and when the tide goes out the water has got to be a 1/4 mile from the beach. On the way back we had to go through an agriculture inspection station. We waited about 45 minutes and then had to get out of the car while they checked for drugs etc. This was worse then the border crossing which took us less time. We were so glad we did not take the RV down. We could only imagine how long it would have taken to go through the inspections. We drove to Los Algondes Mexico so Ron could get his teeth cleaned. Now this was an interesting Mexico town right on the border of California and Arizona. We could not believe the paved parking lot on the American side and how many American’s and Canadian’s come here for dental work, hip/knee replacements, pharmacy etc. Everything is like 50-75% cheaper then in the states. The town was clean with lots of shopping but lots of dental offices, farmacia’s, optometrists and restaurants and of course the souvenir stores. Yuma is a pretty big town so we were able to go shopping for dog food and people food. We also went and saw Star Wars. Ron has been wanting to see this since it came out. I have never seen any of the Star War movies but for Ron I would go. He had to explain to me after who the First Resistance and the Dark Side was, Luke Skywalker and Darth Vader…. Oh well………. So yesterday we left early because there was a storm and wind coming and headed to Salome out in the middle of nowhere but still a nice park. The wind picked up in the afternoon, we had a lightning show and the rain came. Today is cold, windy and cloudy but it won’t last long, the sun and warmth will be back within the next few days. Just like the boat we are in a place with limited wi-fi so I will post pictures next time we have decent wi-fi service. Well we left Visalia and headed to Bullhead City to visit with my sister and Calvin. We were hoping for sunshine but it was very windy for several days and then the rain came. I guess we have that rain cloud following us. We had a very nice New Year’s Eve. We got to celebrate twice. Arizona is not on daylight savings so we had New Year’s in Arizona then took a boat ride to Laughlin and celebrated there with fireworks. It was cold……. We left one rainy day and took a back dirt road to Oatman. Been there years ago on our motorcycles now we come by Jeep. Found the Oatman hotel and had lunch and then looked around in a few stores that were open. There is a herd of Burros that live there because tourists feed them and I think the locals do too. They were getting out of the rain also by standing on the board walks under the overhang to keep dry. Had to go through and around them to walk down the boardwalk. They weren’t moving! We left Bullhead City and about 40 minutes out the engine light came on so we immediately pulled over. It was not safe on the side of the road so we saw an RV park up a few miles and decided to try to get there and call road assistance. We had lost all the coolant so we knew we must have a broken a hose somewhere. Ron could not find it so roadside assistance came out and it was a small hose on the top of the engine. About 4 hours later and a few dollars lighter we headed back out to Quartzsite. Of course it was dark when we got there. Seems every time we leave we end up where we are going in the dark. Our friend Gage Smith had a great place for us to park and hook up. We visited with Gage and he showed us around the town. Quartzsite hosts the largest outdoor market (flea market/garage sale). There are RV’s everywhere from boondocking (as we have been told it is called dry camping) to RV parks. They just park where ever in the desert. Tons of rocks/gems/beads. It was pretty amazing. No restaurants except for a pizza parlor that was packed. We left Quartzsite and headed to Casa Grande on Sunday 1/10/16 which was about 2 1/2 hour drive through Phoenix. The weather is getting better. We can actually sit outside in the sunshine. Monday we went into town and got pedicures. Boy was that needed since I might be able to wear sandals. Tuesday we are meeting our friends Jan and Gary Cotten in Chandler. We have not seen them for many years. Can’t wait. I will try to get some pictures of the desert lol……..
Ron and I left Washington last week hoping to beat the storm and get over the Siskiyou’s. We stayed the night in Canyonville Oregon. The roads were clear and thought about continuing onto California but decided against it since the pass maybe icy and the storm was not suppose to come in for another day. Well we heard the rain in the middle of the night and it did not stop. Woke up the next morning and checked the pass to see if we could get over. No of course not it was snowing and going to continue for the next several days. Now what do we do? Stay in Oregon or try to get over to the coast. We checked all the roads and found that it was not snowing on the hwy from Grants Pass to Crescent City so we decided to go. It was raining and windy only 85 miles but 3 hours later we finally hit 101 and the coast. Lots of switch backs and narrow roads It was just like being on the boat in the 16 ft waves lol…..
Once we were on Hwy 101 we thought it would get better but of course not the rain, wind and narrow roads were following us. The only exciting thing was that we saw a sign about Elk. We have never seen elk when we see these signs so we were not expecting to see them. So as we are driving we see something ahead on the highway and started to slow. It was ELK. We made it to Clearlake for the night. The next morning we headed to West Sacramento to an RV park to park the motorhome unhook the jeep and drive to Carson City to register the jeep. We left at 12:00 p.m. again drove through wind, rain, snow, fog and anything else the weather could throw at us. We made it to DMV registered the jeep, saw my brother and drove back to West Sacramento and were back by 8:00 p.m. What a day……. The next morning we headed to Visalia. The sun was out and blue sky. Ron sat outside with a cup of coffee enjoying he warmth on his face. Had not been able to do that for a while. We spent Christmas with our boys and grandkids which we have not been able to do for many years. I cooked prime rib, garlic mashed potatoes, sautéed brussel sprout. Yes believe it or not I can cook!!!!! December 29, is Ron’s birthday kind of a big one. I think we will take him out to dinner with the kids. 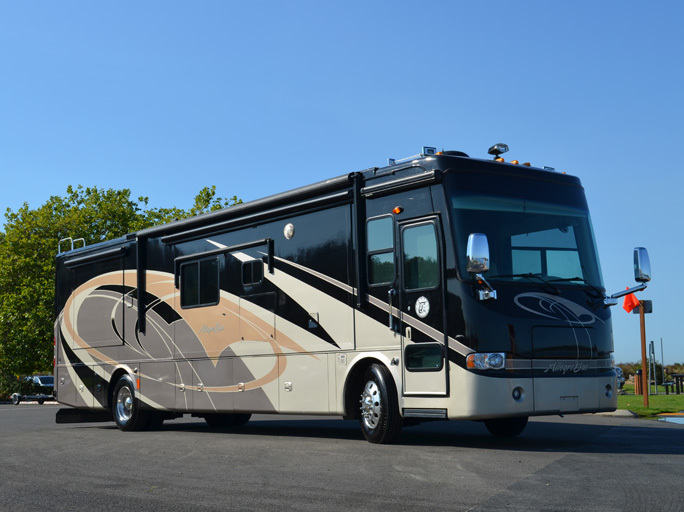 Since purchasing the land yacht “No Regrets” we have been to Carson City visited friends for a week, spent all day in DMV (no fun dealing with the government) but got the coach registered. We took the Porsche out of storage and drove her for the week. She was in snow and rain for the first time. The weather was blue sky but really cold. Ron and I decided that we wanted to head back to Washington before the next storm hit and we could get over the Siskiyou Mountains. We left yesterday morning and headed towards Oregon. We stopped at Moon Mountain RV Park in Grants Pass about 5:00. Of course it started raining in the night along with wind blowing. At least we beat the snow. We decided to go to Coos Bay/North Bend this morning to get over on the coast and go up 101. We took OR-42 to 101 weather was not bad even had sunshine a few times. 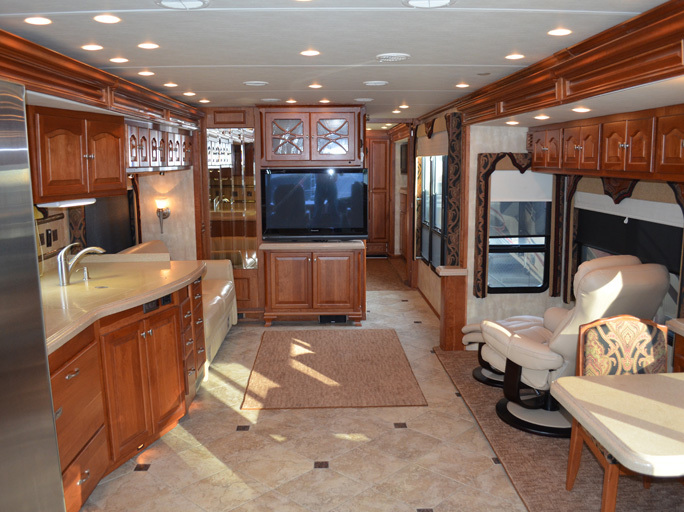 Ron wanted to know why all the motorhomes were heading South….I told him that we were different lol…. We decided to stay at Mill Creek Casino RV Park right on the bay. We feel at home again close to the water……. On a side note I have only been able to drive the bus once since leaving Washington. I have always done most of the driving when traveling but I guess the rolls have changed again. Bailey and Brandy are getting use to another method of traveling. Bailey has decided she likes to watch out the front window. So just an update since my last post in August. Since coming back from Alaska my Mother is doing much better. I have become that pest of a daughter going to all her doctor appointments. It was really scary there for a while and I was over helping out on a daily basis. Once she was back on her feet Ron and I motored over to Seattle for a week staying in Lake Union. 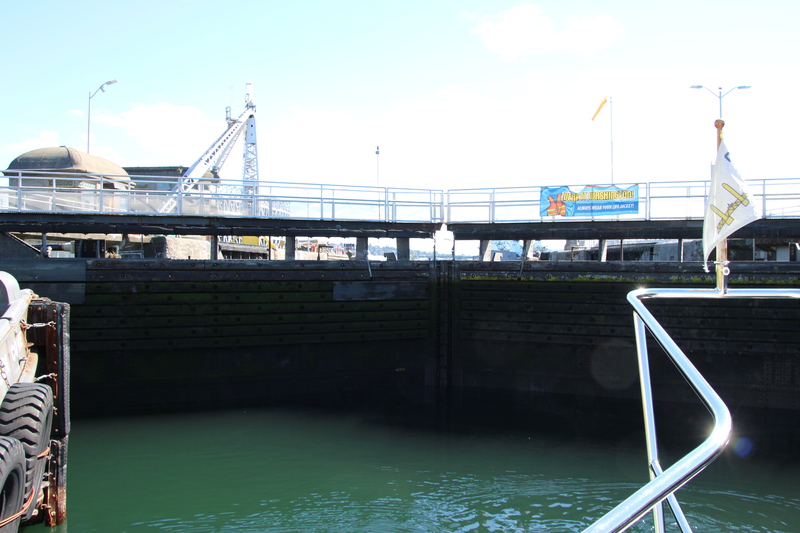 Going through the locks was exciting again. After waiting for a while we tried to get in to the small locks and were to long so had to back out and wait for the commercial locks to open. In the meantime the bow thruster went out just as the locks were opening so we motored to the back of the line and thankfully we were able to tie up next to a big tug at the entrance so we were the first ones out. 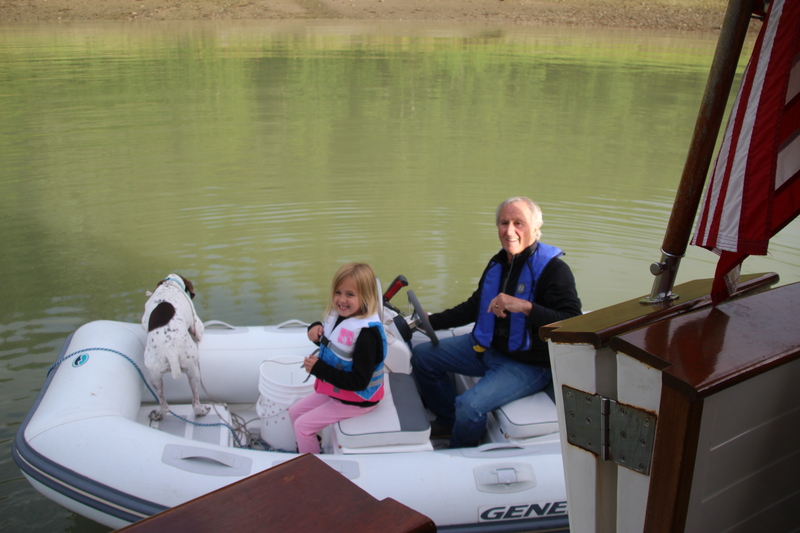 The bow thruster was working by then we just wore the batteries down and they needed to re-charge. The day we got there we had a phone call and then a visit from Stephen and Trisha Lincoln who were at the boat show. They came by the boat and we did some catching up. Great fun and cocktails……Ron and I rode our bikes to the boat show the next day in the rain. It is always raining in Seattle lol……Then one day we took a cab to Pike Place Market. Ron had never been. We walked through the market and of course had to by fresh shrimp, pasta and of course a bouquet of flowers. Then we walked down to the waterfront and had clam chowder at the newly remodeled Ivar’s. Ivar’s meals now include the tips. No tips for the waitress….This is something Washington seems to be going to. After a week we finally decided to motor home and reclaim our animals. 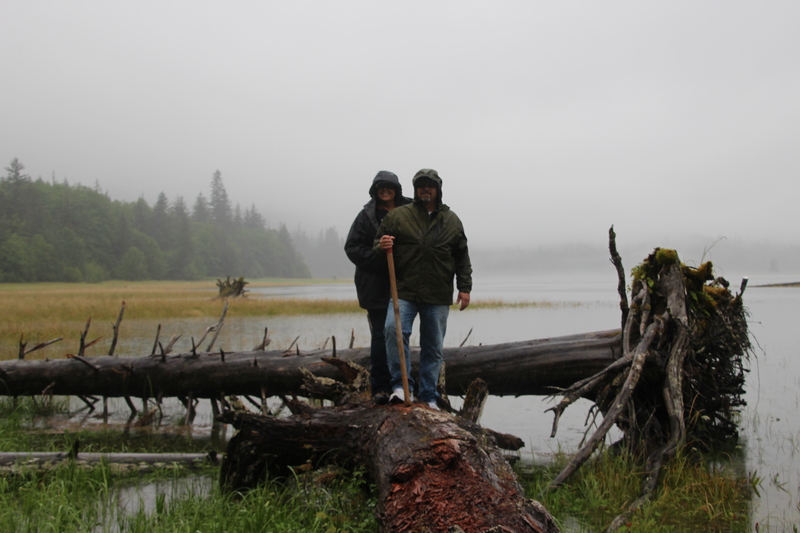 My parents had been babysitting…..The weather going back was absolutely beautiful until we got to Port Ludlow then it was cold and windy. After not making our trip South for the winter in the boat Ron and I decided that we would travel in a land yacht so we now own a 40′ Tiffin Allegro Bus (No Agenda). Ron and I have decided we are vagabonds we just can’t stay in one place to long. Plus we need the warm weather a huge driving factor. We tried getting to Carson City for Nevada Day but just couldn’t get everything done to leave. We are now on the road again just on land this time. We left Friday morning 11/6 to head to Carson City. Ron pulled over about Roseburg Oregon and said that I need to learn to drive the bus. My palms sweating, my hearting pounding I got into the driver seat and got my self ready. Here we go. It was not that bad only white knuckled it for about 3 hours and by the time we were heading up the Siskiyou pass in the dark I was feeling a lot better. Just had to watch for all those truckers that like to take all three lanes. It really was not that bad to drive and very comfortable. We stayed the night in Weed at a rest stop we got up the next morning and headed out. Ron is becoming a pro at driving also. Once we got into Carson City we decided to stay at the Gold Dust West RV Park. It is more open and we need practice getting into the parks and setting up. Low and behold it did not take that long. We had our friend Tracy come by and give Ron a ride to our storage unit to get the Porsche so we could get around town. We went to Avis Cherry’s installation dinner and had fun catching up with a lot of our friends. We are going to stay here a week get some personal stuff done and then head out going back the California/Oregon Coast back to Washington for Thanksgiving. Hopefully the weather will hold up….I will be doing a lot of praying. So an update, Ron and I left Port McNeill on August 16, 2015 to head down Johnston Strait and as we passed Alert Bay we were only doing 5 kts (really slow) and figured it was going to be a long day. Down the strait I saw what looked like some porpoise’s swimming towards us but soon we were greeted by a warden in a tender telling us that we were close to a Biological Marine Park and did we see the whales? Also to stay 100 meters away from them, so we motored over to our port side and went around them. We were not even close. We are in Canada remember? In Alaska we were motoring along and Whales came up all around us. We turned off the motor and just sat there; no wardens came up and told us to move on. Just sayin’ Soon we started picking up some speed and thought we would stay in Kelsey Bay. By the time we got there we looked at the currents and found out we could make Seymour Narrows by slack water time that evening. Weather was nice so we decided to go for it. We got there about an 1 ½ hours before slack which means that we were still going to hit current but it was favoring us. We were going 12 through the channel… who hoo. As we motored through the narrows it said to watch for the Ripple Rock in the middle. Of course Ron decided to go right over it on the chart. I was telling him to move off of it but he said we had plenty of room and water under us and we needed to get through this. Well that was just a start to how the evening was going to finish. Now we are in Campbell River trying to find a place to stay. Public docks were full so we decided to anchor in Gowlland Bay. First we had to go through a very narrow, not deep channel. I am trying to cook something for dinner and kept running up to the bridge to make sure Ron was motoring right. 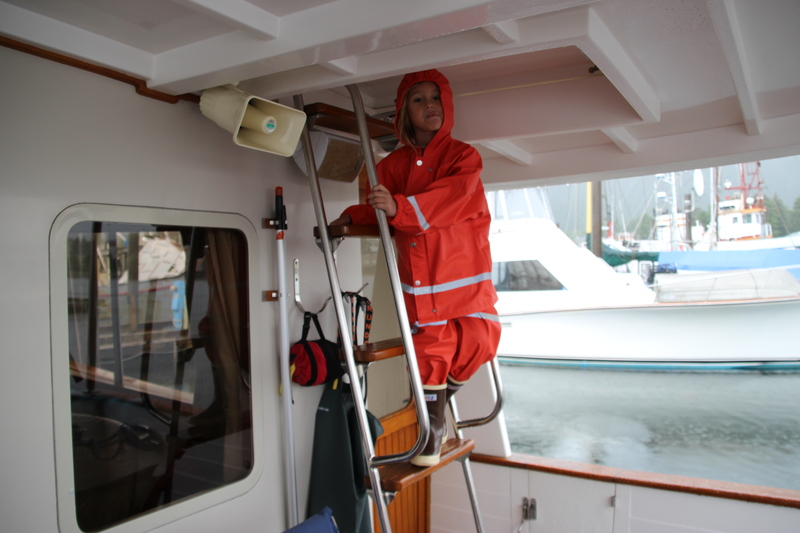 If any of you know us you can only imagine me panicking and Ron under control lol…… We made it through only after Ron went into 6 feet of water our draft 5 and on the chart he was over the area that goes dry at low tide. He said “well we had 6 feet of water under us, that’s plenty.” Thank God it was high tide still. 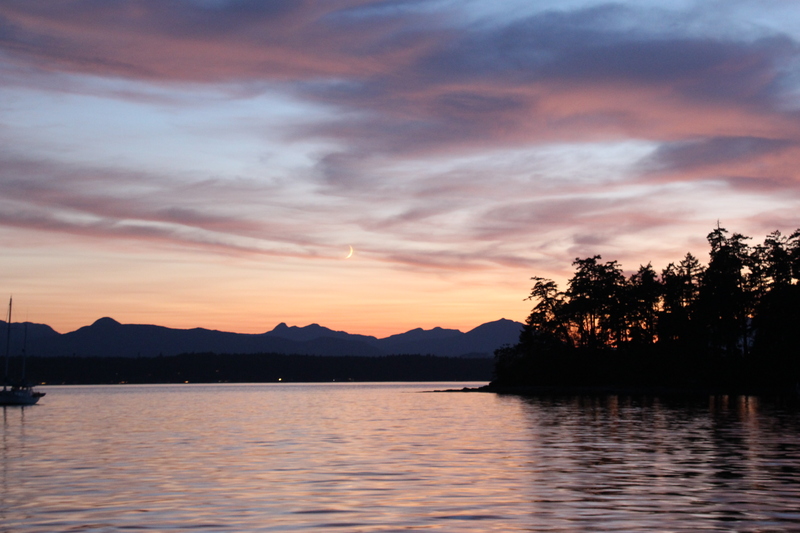 We arrived in Friday Harbor August 18, 2015 and cleared customs. They did not like the 2 lemons we had from Alaska so they took them. We told them we bought them in Alaska. He said “I don’t know that”. Ron said well I’m telling you we did. No difference he took them. Canada customs didn’t care we had them. Oh well we seem to not do well with customs agents. We will be making our final journey back to our marina tomorrow. 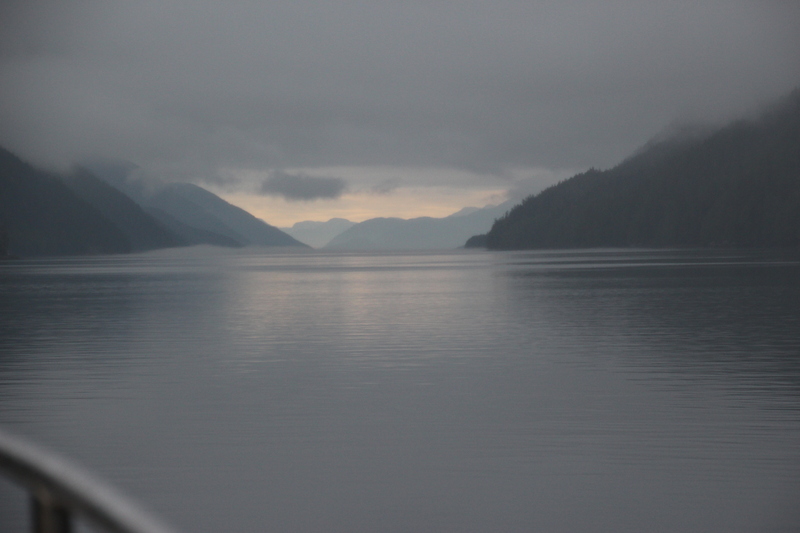 Our latest update is that we left Wrangell on Sunday August 10, 2015 to make our way home South. 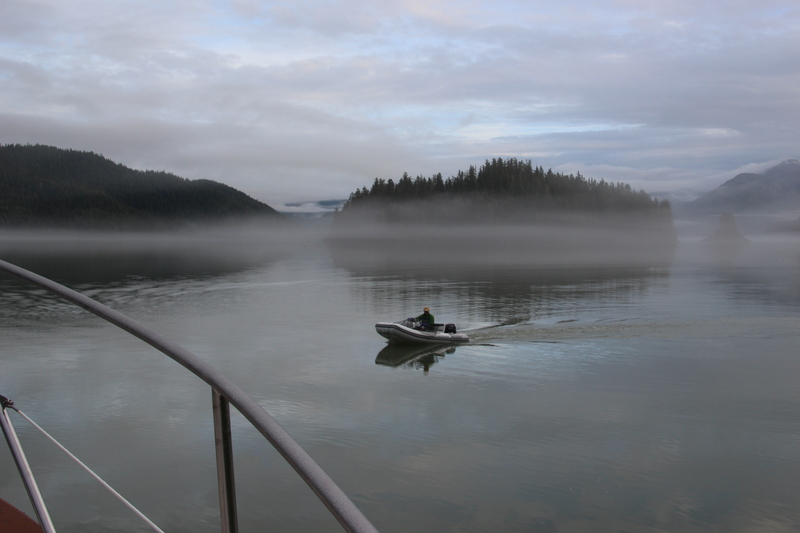 The day started off nice and decided that Clarence Strait was to much to get into Ketchikan for the night so we anchored in Meyers Chuck. We left early the next morning stopped in Ketchikan for petro (fuel) and headed out towards Dixon Entrance. 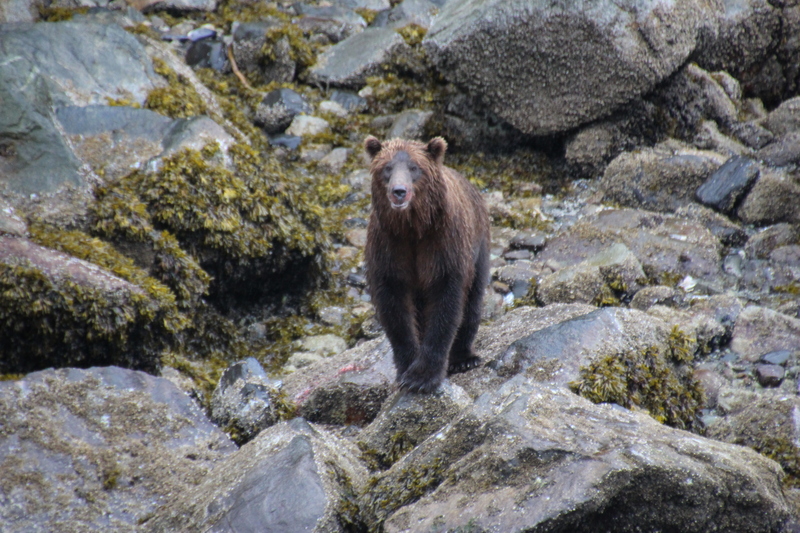 Dixon was very calm but it would have been to long of a day to make it to Prince Rupert so we stopped half way in Fury Cove. This cove was very narrow to get into but so beautiful when we got back there. No one there, we had it all to ourselves until evening and four other boats showed up. 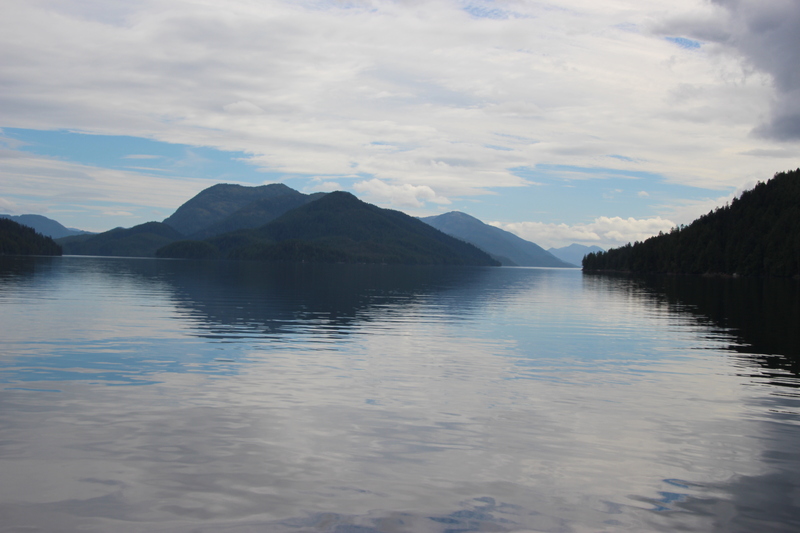 We wanted to head out early the next morning for the 7 hour ride to Prince Rupert hoping the seas were calm like yesterday. Boy did we luck out there. But I had phone messages as soon as we had service and my Mom was in the hospital in ICU with zero white blood count and blood pressure low. Ron and I had to decide to head for home quickly. We made it to Prince Rupert cleared customs and headed out. We finally anchored at 9:30 that night in the dark and only relying on your charts. The anchor alarm went off at 3:00 in the morning and we could still not see anything but it appeared we were not close to shore or the rock on the chart. We had just done a 360 degree turn so we went back to sleep for a few more hours. The next morning was foggy and heavy mist when we left at 5:30 a.m. ready for our next 100 kt. day. Feeling our way by chart and radar. The sun shined finally in the afternoon and we decided to stop earlier and not to anchor in the dark. We stopped at another little cove off Albert Island in the light. Our next day was going to be long trying to get to Fury Cove. The waters were calm and we got there by late afternoon and were able to sit on the bow of the boat to relax before our next day crossing Queen Charlotte Sound. As soon as we had cell service we were checking on Mom. She had been moved to Swedish Hospital in Seattle waiting for test results. We went to bed early and woke up to check the weather which was reporting 6 ft seas so we decided to wait a few hours and go for it if it did not change. We knew we had a 7 hour crossing. As soon as we started we had swells but they just continued to grow. Predicted 6 ft swells was more like 10 ft swells. Crossing in a beam sea and then finally a following sea which the boat handled much better. We would go up and the swells would come by and we would go down. I told Ron we weren’t suppose to be doing this again but we did not have time to wait out weather. Barometer was falling. Luckily this time we made sure everything was tied down the night before which helped tremendously with no noise of things banging around in the boat. Our boat handles the rough sea just fine, never a time that we thought we were in any danger. It’s just a very rough ride that seems to never end. We would rather have smooth sea, but there are times you just don’t have a choice. But we remind ourselves we have a boat that can handle it even if we don’t like it. We got into Port McNeill yesterday and I called my sister. My Mom was coming home that the tests showed something other then what they thought. She is weak and going to need therapy and someone to come in daily for a while but at least she is home and on the mend. Ron and I drew a deep breath Praise the Lord and decided to take a little more time getting home. 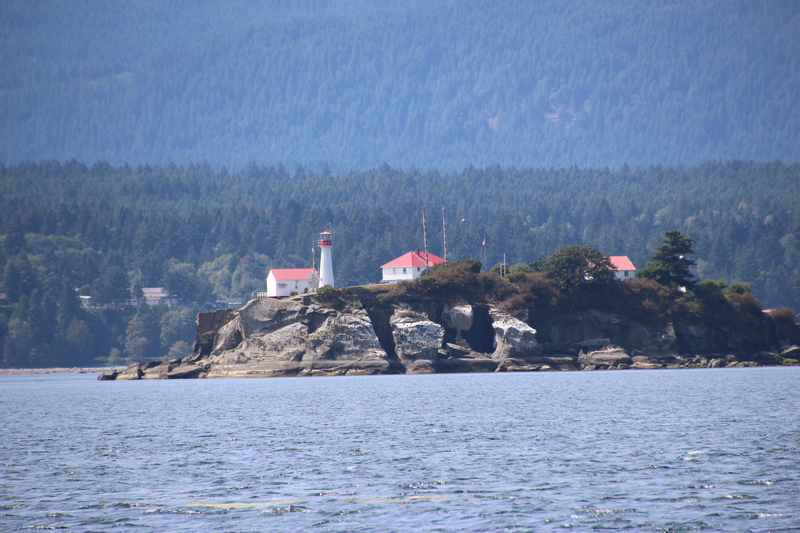 We stayed an extra day in Port McNeill did laundry, provisioned, cleaned and relaxed in the sun shine. Yes we have a beautiful sunny day……. Well we had to say goodbye to our daughter and son-in-law Shannon and Jeff on Saturday from Wrangell. They flew into Petersburg just before our son and granddaughter Jason and Carter flew out. Jeff said he brought us the sunshine and he is the “drought king.” We only had sunshine two days so not sure he is the sunshine king or drought king or whatever…… We motored through Wrangell Narrows from Petersburg and, stayed in St. John Harbor where there are the most beautiful sunsets when of course the sun has been out, and then headed down to Anan Bear Observatory. You need a permit to get in the observatory so we called Wrangell Ranger Station and they had only 4 permits left for the day we wanted to go. So on our way we stopped in Wrangel and picked them up. Getting to the ranger station was not exactly easy. Jeff and I set off. Ron and Shannon stayed behind with the boat on the transit dock. I was told to go towards town and up the hill on such and such a street. Well we did not find such and such a street as we were all the way at the end of town. Finally Jeff decided to ask and were told it was back about a mile by the hospital. So we continued to hike and found the hospital but it was way beyond town almost to the airport. We finally got our permits and headed back after, according to Jeff a 3-4 mile hike. The sun was shining so it was great exercise. We anchored the night in Berg Bay that night. It was raining and foggy. There is a USFS cabin so we decided to check it out. Behind the cabin was a wooden walk way (very nice one) so low and behold we had to walk it to see where it went according to Ron. I was in the middle of the group singing songs with Shannon and carrying a bell to make noises. Ron was leading and Jeff was bringing up the rear. It was quite a hike to this flat meadow and bay on the other side of the hill. Would have been beautiful if it hadn’t been raining so hard. Rain in South East Alaska is something else. It just pours. Ron was complaining to a local we met and he said “well you are in a rain forest” duh!! They measure rain by the foot not the inch as we do back home. 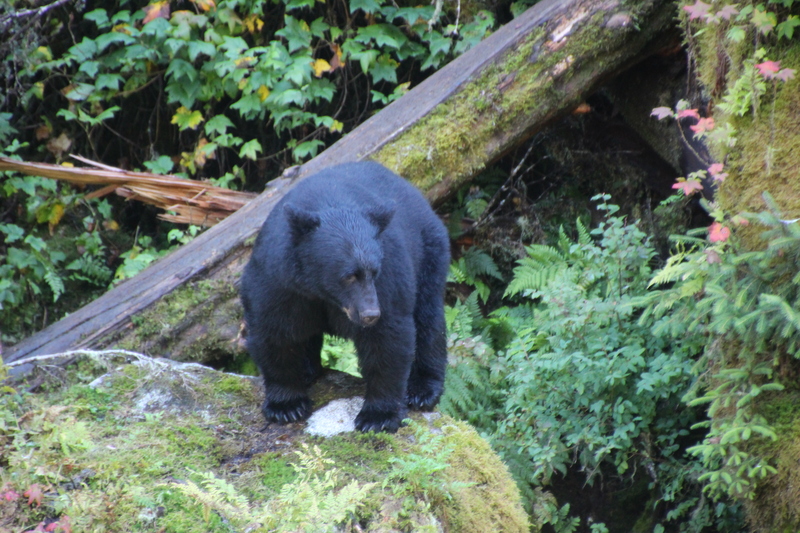 We did not encounter any bears…..probably the singing kept them away. We did later find out a woman had been mauled in that area a few years back. The next day we went to Anan Bear Observatory and we took turns going to see the bears so that someone was on the boat at all times as anchorage is questionable. Jeff and Shannon took the dingy to shore and went first and they came back ecstatic so we went next. There was no ranger to meet us where we beached the dingy, and the wooden walk-way started, so we started walking and about half way to the observation hut (1/4 mile?) there was a bear coming up the draw by the walk-way we were on. We continued to move along making a lot of noise. He/she watched us but made no threatening moves. After we got past we walked backwards keeping an eye on her/he. 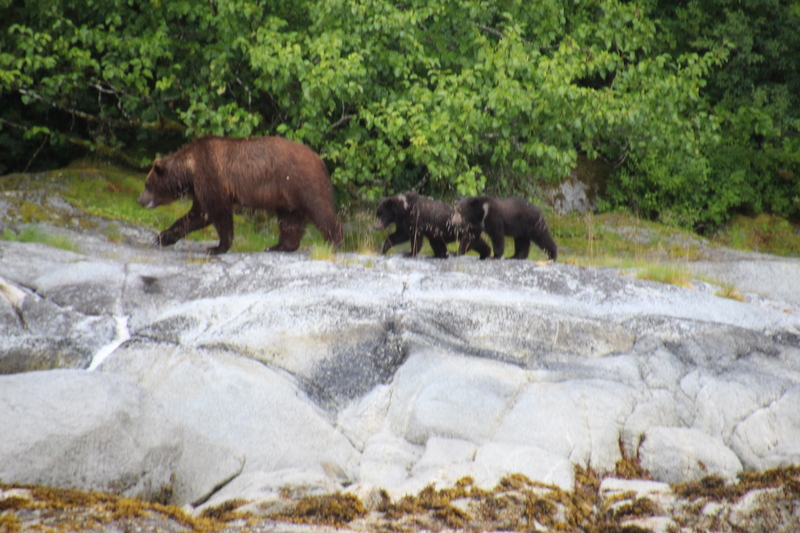 ( Didn’t want to get close enough to make out if the bear was a he or she) We got to the observatory and there was a mama grizzly bear and 3 cubs along with a couple of black bears in the river catching fish. 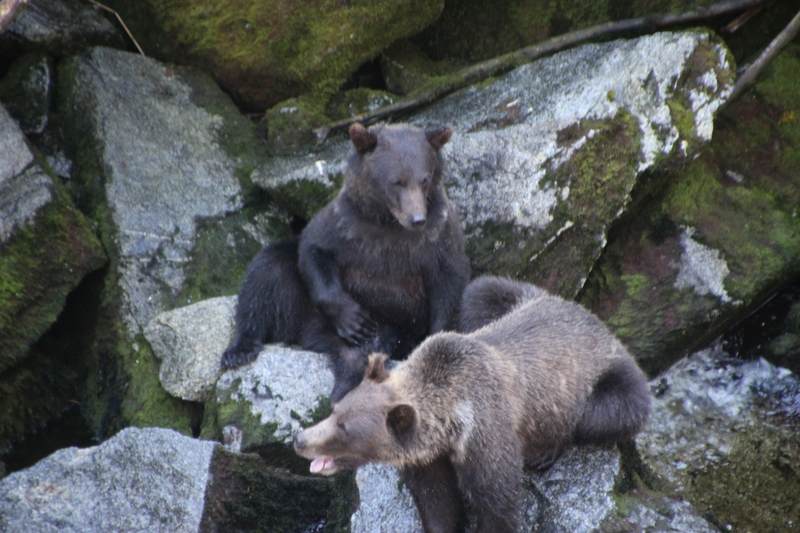 The black bears didn’t get too near the grizzlies, especially mom and her three cubs.. They kept their distance. We watched them all for a few hours. It was so cool to be that close to a wild bears in their habitat not a zoo. No bars between us…….. When we were ready to leave the ranger had us wait as they did not have an eye on the mama bear and she can be testy. She had false charged a ranger a day before. She had left the river where she and cubs were fishing and the ranger didn’t know where she went and wanted to get “eyes” on her before he let us go back down the trail. Finally we left in a group of other people that were there also and just made lots of noise.They had guns, we had a can of bear spray. The sun was shining that day….whohoo. Our next stop was Thoms Place. Jeff and Shannon went out in the dinghy just exploring and of course it was raining and windy. Our next day on the way to Wrangell we decided to do some fishing in Anita Bay. We thought about staying the night but the commercial gill netters had the entire bay taken up stringing their nets across the bay. We thought it would be a great area to catch fish if the fishing boats were all out there. It had worked before, but such luck….came up empty handed. 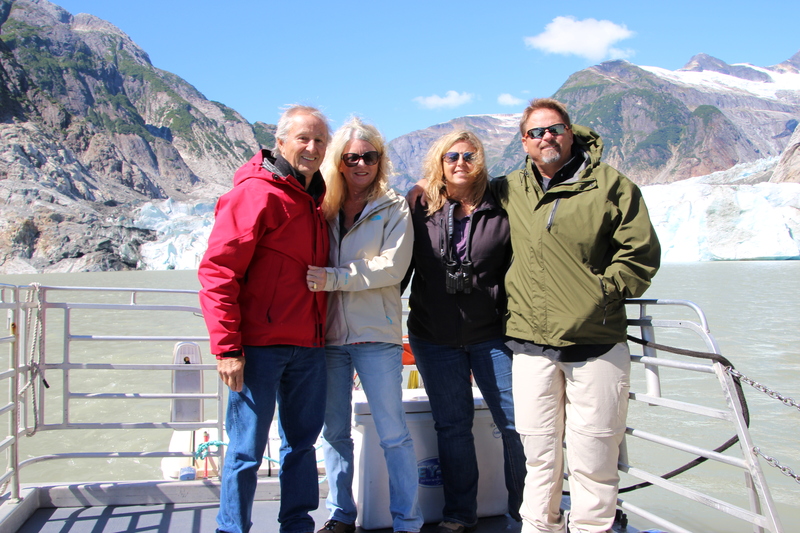 Just before Jeff and Shannon were to fly home we took the trip up the Stikene River to the Shakes Glacier and it was a beautiful sunny day A lot different than the last time we were there. 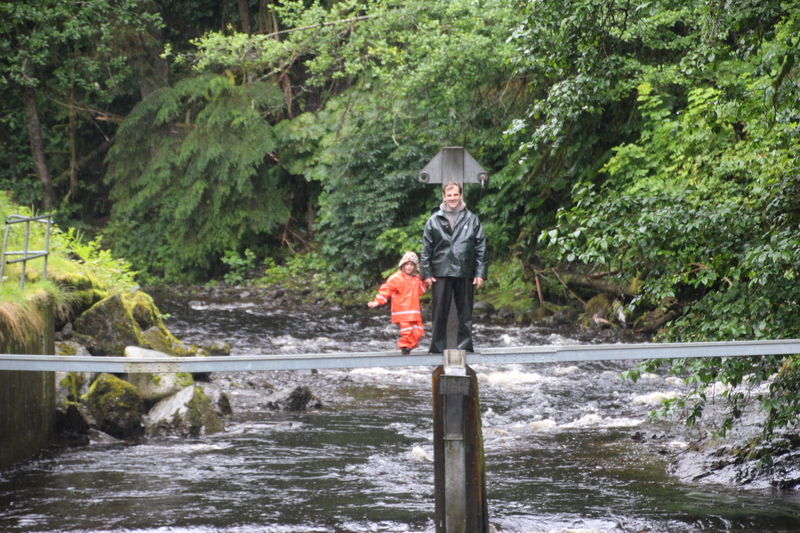 Jason and Carter flew into Sitka last week and it has not stopped raining. So our first plan was to get Carter all geared out for the weather. She has her Grundins and Xtratufs. She immediately was running through water puddles so cute…. Our first stop was Appleton Cove which was late in the afternoon. Jason tried some fishing and we set out crab pots. The next morning we had one crab only and this star fish eating the crab bait. 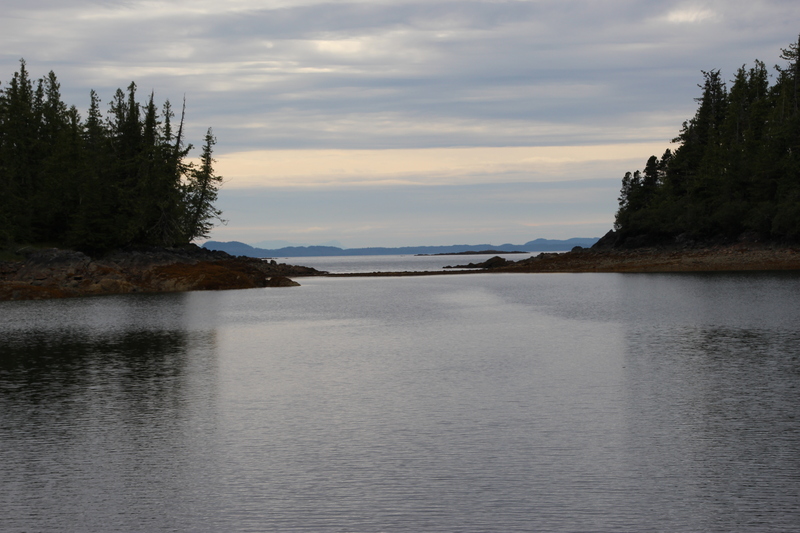 We got up early the next morning to head to Ell Cove down Chatham Strait. We wanted to get down the Strait before the 3 ft waves started. We did pretty well for the first few hours then it kicked up. I was at the helm and needed to make the turn into the cove having to go into a beam sea. Well I didn’t quite make it and we went into the trough and started to roll. Ron had to immediately take the wheel to get us back on track. Just another learning experience lol……But when we got backin the cove it was beautiful and all to ourselves. Ron got the dinghy down and they went off to see the bears by the fishery. They were up close and personal to the bears. 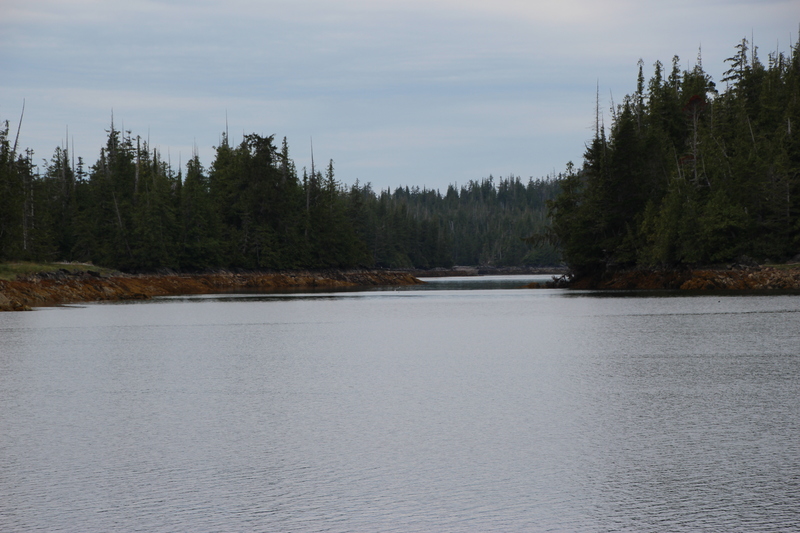 We left again early the next morning to continue back down Chatham Strait to Red Bluff Cove. 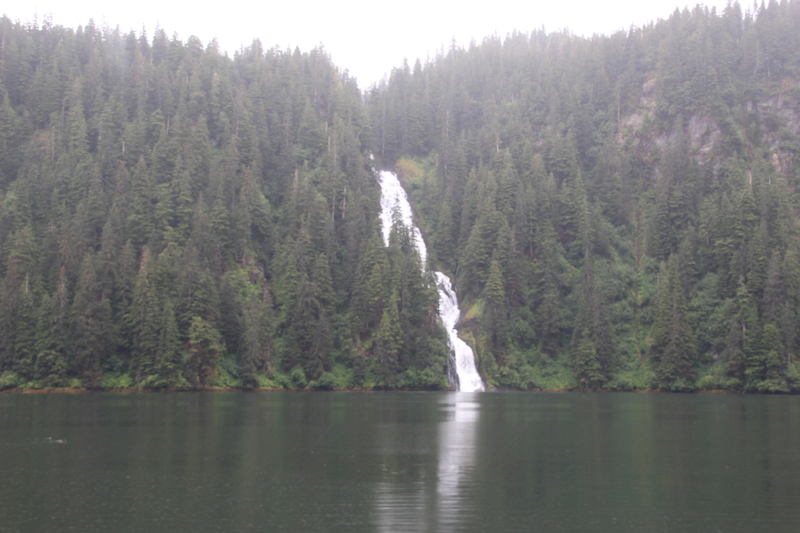 We winded our way to the back with beautiful fjords on both side and waterfalls. Again it was still raining with low clouds. 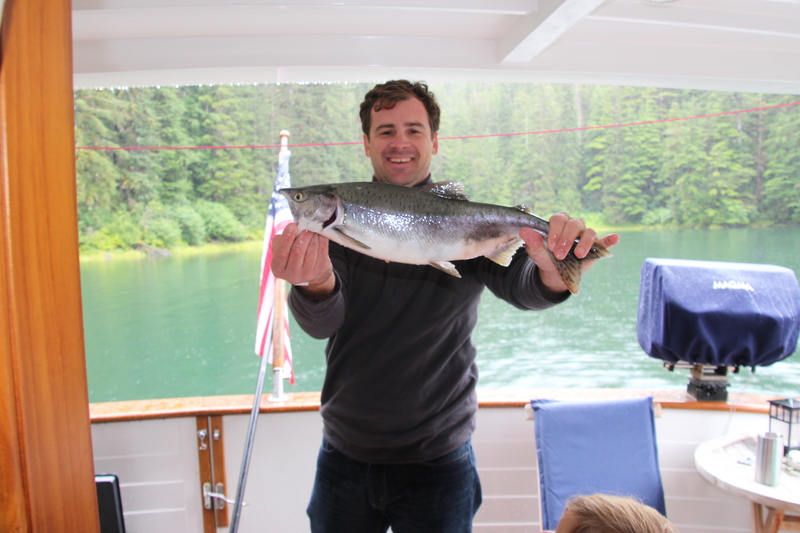 Jason started fishing and snagged a salmon yea sushi for dinner. We then got ourselves dressed in our rain gear and went out in the dinghy trying to get up the river but did not get very far. But we did see all the salmon trying to go up stream but no bears. 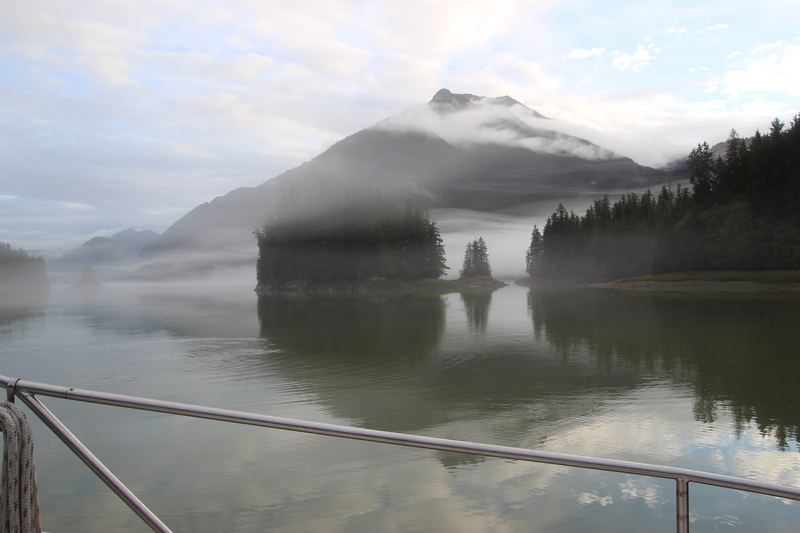 The next morning we headed across Chatham Strait to Kake. I really was done getting up early just to get through Chatham Strait. Guess we were still remembering our experience the last time…..On our way to Kake we finally saw a lot of whales bubble feeding. Again raining the whole way. Finally we anchored and decided to check out the town of Kake. Not much there. Carter got to play in all the mud puddles as we walked down the street. 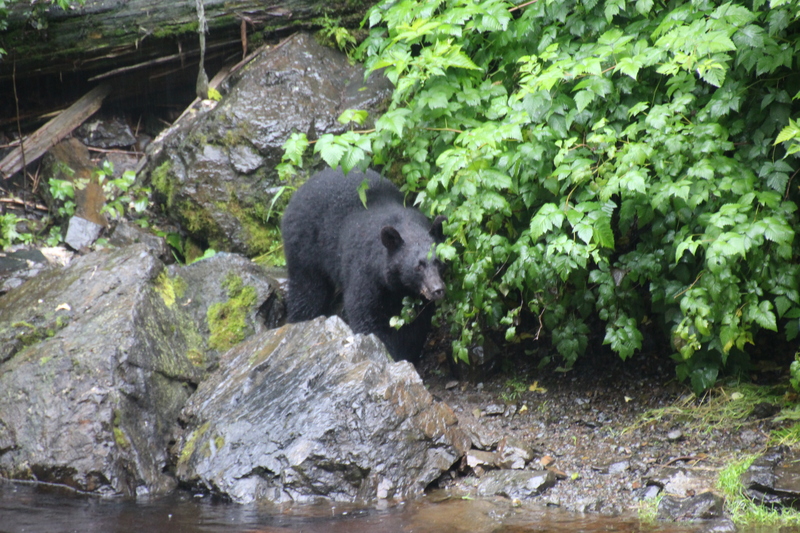 A guy came by us walking and told us about the fishery up the road and that there are black bears and that they were have some festival on Saturday that we should stay and enjoy the festivities. Since there was not much to do in Kake and it was only Thursday we decided not to stay. We hiked up to the fishery which is now closed and saw girls down in the river trying to catch salmon in shorts while it is pouring rain. I guess they don’t know when the sun is shining or raining. While we were there a black bear came out of the trees and started wandering down the stream, but the dog with the girls saw him and started barking. The bear retreated back to the woods and didn’t see him again. Kake has the largest Totem Pole in Alaska. As we were anchored outside of Kake another boat that we were anchored next to in Red Bluff Cove appeared to have went aground during low tide so we watched as they tried to get the boat moved out because tide was not completely out. They made it……We put out crab pots but no such luck only those funny looking star fish. 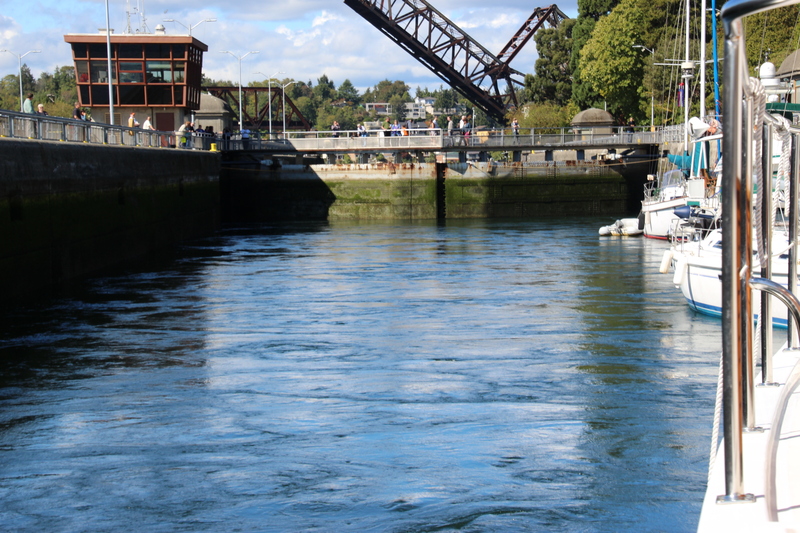 Our next stop was Portage Bay and we went through entering the cove at high tide. 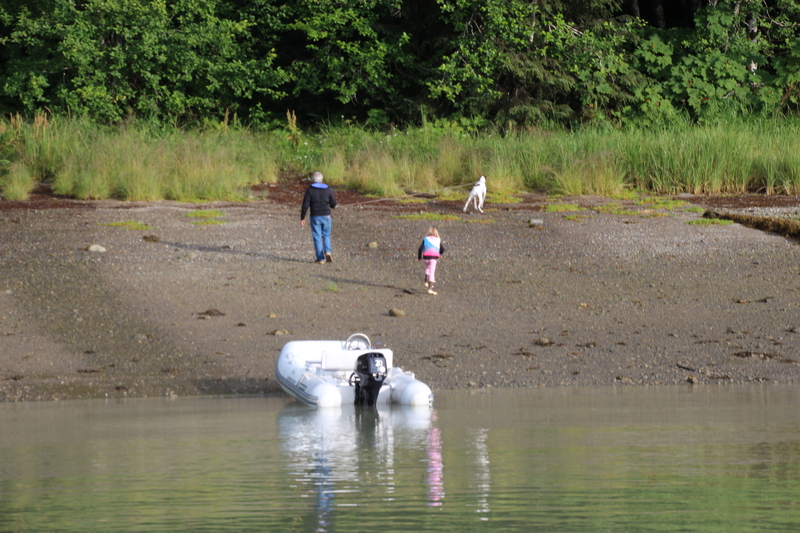 We finally had some sun so Jason and Carter took off in the dinghy with the bear spray and no walkie talkie. Just like his Dad going exploring and out for hours with no communication. Finally he and Carter emerged from the woods and headed out to the end of the cove enjoying the weather. The next morning we wanted to get out before low tide which was a minus. We hit slack but did go through 9 feet thank God we didn’t wait for complete low tide to go through. 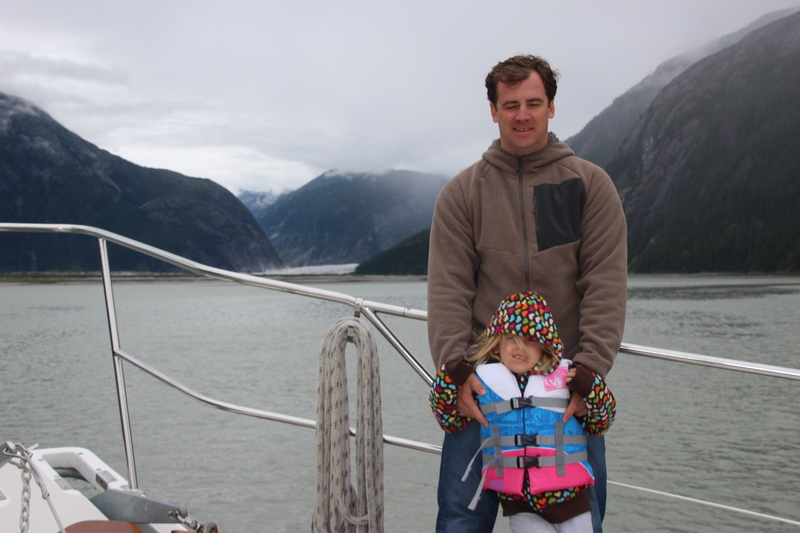 We motored to Thomas Bay and saw the Baird Glacier. Jason and I spelled rotten fish outside and was glad we were not anchoring there. We motored to Cascade Creek Bight and anchored and stern tied. While i was outside Jason and I could still smell rotten fish. 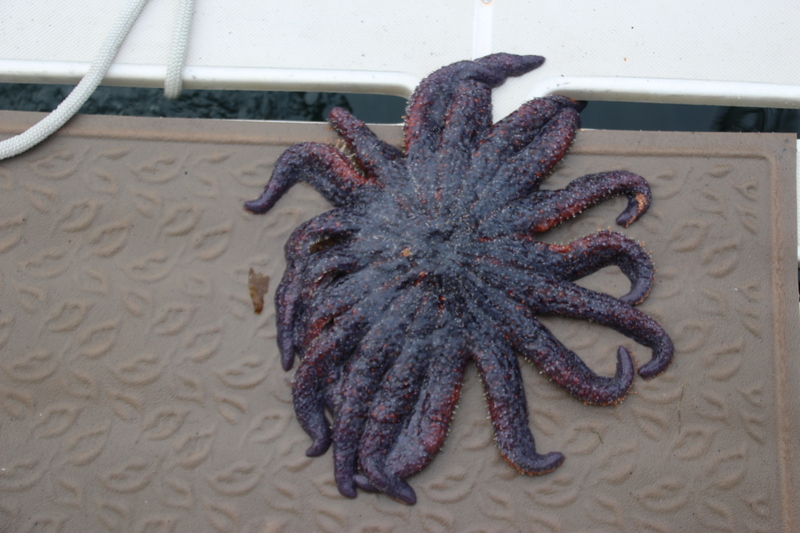 I finally found the source and it was a bucket on the side of the boat with rotten fish (carcass from the salmon) Ron was saving to put in the crab pots. I made him get the crab pots down immediately. We caught two crab the next morning. Guess it worked. Again we had another beautiful day but Jason had to take the dinghy out and find the rain. Bailey got to go to shore and run and play which she had not been able to do for a while. Carter and Papa played hide in seek with Bailey in the tall grass. We did not have long to get to Petersburg the next day and of course it was raining. Now the kids are leaving and Jeff and Shannon just flew in so we are off today headed towards Wrangell. Great time with the kids we will miss them.